When people talk about “the internet,” what they generally mean is the world wide web, an information space through which resources can be accessed via hyperlinks. But that system only dates back to 1989. The internet itself, a global network of interconnected computers, traces its lineage all the way back to the 1960s, decades before social media, search engines, or even browsers were available. David Newbury, a lead developer of the Art Tracks initiative at Pittsburgh’s Carnegie Museum Of Art, recently shared via Twitter a rather incredible document he found among his father’s papers: a map of the entire internet as it looked in May 1973. The net looks like a sparse, lonely place during the Nixon years. Before the modern internet, there was the ARPANET (Advanced Research Projects Agency Network). Funded by the U.S. Department Of Defense, it was a secure computer network that initially was used to convey military intelligence between academic institutions like MIT and UCLA. 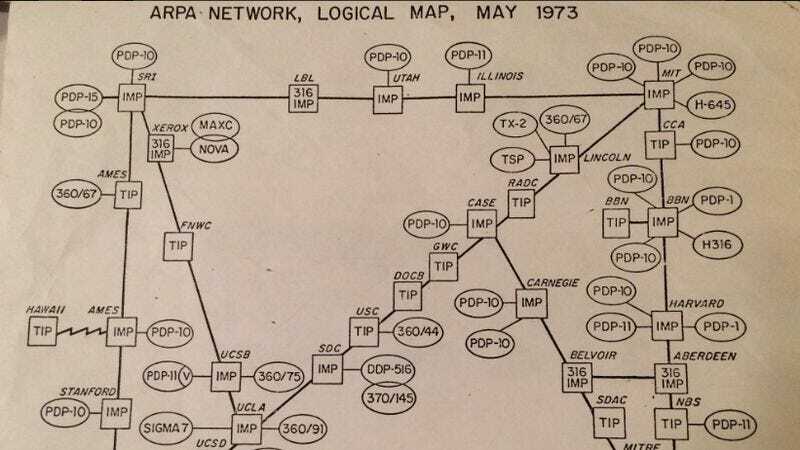 According to Atlas Osbscura, Newbury’s father, Paul, worked at Carnegie Mellon at a time when ARPANET was “secret and very small.” In 1973, his map of the entire system could easily fit onto one page and still be quite legible. By this point, ARPANET had expanded beyond academia to include some government labs and private research organizations, too. Deane Barker then responded to Newbury with a December 1969 version of the map. As these maps show, the internet was an exclusive, clandestine, and deeply nerdy world of computer experts back then. Not an emoji or cat video in sight. The fun stuff was all in the future.